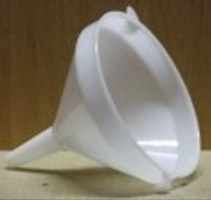 A heavy duty plastic funnel complete with integrated straining disk. This 7" (18cm approx) diameter funnel is manufactured from heavy duty food grade plastic and comes complete with an integrated straining disk. It can be used for many jobs in home beer and wine making.